Imagine putting this thing on a ring. 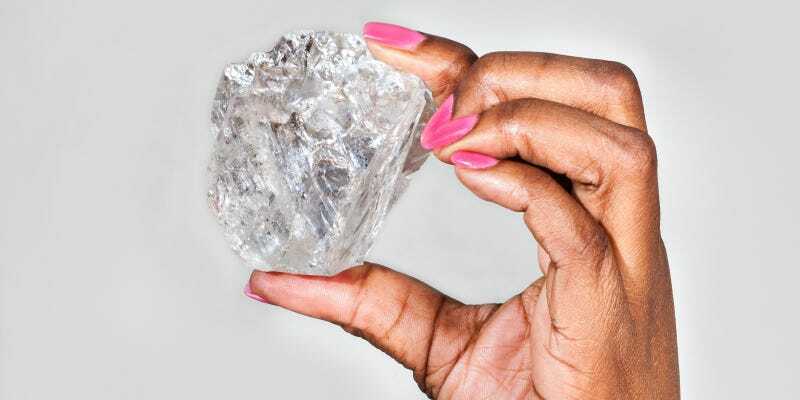 You’re looking at the biggest diamond to be found in the last 100 years, which was discovered in a mine in north-central Botswana. Lucara Diamond, the company that controls the mine in question, reports that the stone weighs in at a frankly staggering 1,111 carats. That’s 7.8 ounces of raw, unadulterated bling, that measures 65 x 56 x 40 millimeters. The largest diamond ever to be found was recovered from a mine near Pretoria, South Africa, way back in 1905. That stone, known as the Cullinan Diamond, clocked in at 3,106-carats—about 1.4 pounds—and was eventually cut into several large gems, two of which appear in the British Crown Jewels. It’s not yet clear what will happen to the new stone.